whole wheat bread Toad. We like feeding the sifted out hard bits to starters and levains. The reason is simple enough, they love it and are most virorous that wasy and and the longer the hard bits are wet the better for the bread. Still think you could drop the CY and no one would notice. Maybe it wouldn't;t rise as much but raisin yeast water levain can be pretty explosive all by itself - especially if fed the hard bits. Funny you mention about leaving out the CY. I have done that and it works fine but can make for a late night of baking. That pinch of CY speeds the proof along enough to have the bread out of the oven before bedtime on nights when the final mix doesn't happen until after dinner. Keeping to that workingman's bread rhythm, for those of us who aren't yet retried, just tired. You give way too much credit for the 'toadies' but I appreciate it all the same. Like I said, nihil sub sole novum. Where do you buy a #55 sieve? Any links to where sieves are available in the US? Such a lovely loaf for 100%. 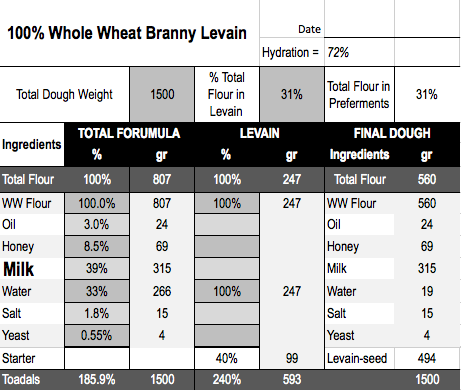 I think using the branny bits in the levain is a brilliant idea. I bought my 55# sieve from Fantes and now find it as essential as my scale. It's the second from the bottom on this page. 55# seems ideal for this purpose. Korin (legendary Japanese knife emporium) also sells stainless steel sieves, but frame and meshes sold separately. They have #50 and #65 but not #55. Others use prospectors'/geologists' sieves but I prefer stainless steel/food grade if possible. I love this formula Tom. I love this formula Tom. Thanks for sharing. I have not been a big fan of Peter's formulas for whole wheat breads but I think this one is awesome and I will have to try it. Just finally broke down and ordered the Sieve as I've been procrastinating spending the money on it, but it was well overdue. Which mill are you using for your flour? Thanks for sharing this great loaf. Thanks Ian. I think you'll love the bread even more than the formula :-). My sieve has become such a valued tool both for store-bought whole wheat flours as well as parked right under my KitchenAid mixer's KGM grain mill attachment. I happen to have a shallow stainless steel salad/mixing bowl with a ~13" diameter rim into which the sieve just fits. So I can hold both and shake together. Amazingly efficient sieving. I will eventualy, inevitably upgrade to a real, dedicated mill. I know which ones I like and when the time is right, I'll choose one and spring. The KA is fine as long as I'm only milling 40% of the flour for one of our weekly bakes, and am willing to run the sieve's retentate back through the mill four times (which I routinely do to achieve 45% retained and 55% pass-through). Milling more than that becomes impractical for the KA with all the remilling required. My table above, and the spreadsheet of which it's a screenshot, was designed from the Bread Bakers Guild of America's specification as described in a 2009 issue of their newsletter Breadlines. My only deviation from theirs is that somewhere along the line I started omitting the seed/starter from the overall formula in the first column. I would have a very hard time indeed baking bread without that tool telling me how much of everything to include. And of course it makes scaling a snap. You are probably aware of Dado and Jacqueline Colussi's Breadstorm, a marvelously sophisticated yet simple digital tool for designing and sharing bread formulae. Ian (Isand66 above) seems to have become an ardent user. But that's the only such tool I'm aware of, so go for it and let a thousand flours bloom! I'm honored to get a comment from a pro :-). I hope your summer season is going well. I'm in awe of anyone trying to bake bread as a business on any scale, from you and Khalid to Ananda and beyond. Hats off. TO PREPARE: Put a dozen or so raisins (I use organic Thompson Seedless) in a pint mason jar. Fill 3/4 with water and add about 1 T honey (cheap stuff -- not White Gold!). Shake it up, loosen lid and leave at room temp. Tighten the lid and shake once or twice a day for a few days. Liquid will become cloudy (the desired bugs) and bubble a little when shaken. Now it's ready to use. TO USE: Mix 1:1 (100% hydration) the RYW (sans raisins) with flour. Incubate overnight. Put rest of mason jar in fridge. The RYW starter should double by morning and smell like wet flour, not like sourdough levain. Use as you would a SD starter in a formula. OR, I confess, you can make the levain directly for your bake (skipping the step of making a starter seed the night before) by mixing RYW with the flour of your formula . For example, using 247 gr of RYW in the formula above. This works for the formula posted here because any flavors the RYW contributes are masked by the enrichments to a bread like this. No guarantees this shortcut won't add detectable flavors to unenriched breads. I've used this shortcut when I've forgotten to set up a levain the night before for a bake of my wife's sandwich bread. TO REGENERATE: A few days before next bake, take RYW out of fridge and pour it 1/2" or so deep into clean mason jar. Dump the old raisins (and don't be tempted to freeze them for a raisin bread: yuk). Add new raisins (or apple or pear peelings -- they have plenty of the right bugs on their skins -- I used crabapples for my first RYW!) plus water to 3/4 full and another T of honey. Shake, etc. as above. RYW is so easy to maintain since most of the time it's refrigerated (my SD culture never gets refrigerated and is therefore more demanding to keep happy). It has terrific levaining power, behaves more like SD than CY and adds little if any flavor to breads. And, as with many consumables, its rewarding to grow your own. YW preferring the apple kind that gets fed cherries too when in season. i save all the spent fruit and use it in banana bread, panettone, babka, fruit cakes etc. Very yummy! Not as good as snockered dried fruits but....what is? Ok, my yuk conclusion is based on a data set with n=1, so I'm open. We follow similarly nothing is wasted household ecology hereabouts and I dutifully froze away spent RYW raisins for several weeks this past winter. Thereupon I used them in a usually wonderful Durum Raisin Toast Bread (that I really should post) and damn if they didn't sully an otherwise delectable loaf. Maybe they carried a wayward population of bugs from the RYW but I haven't been tempted, until your comment above, to save them since, for baking at least. I thought they'd be like a magnificent centuries-old brandied fruit I used to maintain. Not. I've found the RYW protocol I just scribbled for you to be as bulletproof as just about anything I've found in bread baking. Far more than sourdough culture maintenance and usage, no doubt because I maintain the latter exclusively at room temperature, which varies 20˚F seasonally here. One benefit of RYW over CY is that, while it is a very active leavening agent, RYW is not as frenetically active as supercharged genetically tweaked CY that can easily run away from you (which SD rarely does). For me, it's also a luxury to be able to shove the RYW in the fridge after I make a starter with it, then haul it back out ~3 days later to subculture (read: refresh). Maybe I'm more comfortable with it because I have done a lot of microbiology and it's just growing another yeast/bacterial culture, but in this case not a pure one (multiple species). No sterile technique required either! I've even thought to borrow a shaker from the lab and grow my RYW culture in an erlenmeyer flask. Wouldn't make a difference other than to grow to saturation faster with continuous aeration on a shaker. Enough turning the kitchen into a clinical lab though. One caveat: A while back my SD culture suddenly and worryingly lost its character while retaining its leavening power. Repeated refreshment did not rescue it and I had to go back to a dried backup that I keep for just this sort of eventuality. I suspect I contaminated my SD with RYW -- maybe a jar or container used to grow my SD wasn't washed sufficiently free of RYW that had been in it previously. Gotta be careful about that. And back up your SD culture often. I don't know of any case of a commercial operation using RYW, although I'm not sure how I'd know. I'm not exactly tuned into commercial baking circles. I assume that's what you're thinking, for your micro-operation. It is another way to naturally leaven bread without adding the acidic SD notes that some find distasteful. Hope you have a good market Saturday. I don't know how much better one can get with 100%ww sandwich bread than this, without additives like KA's "dough enhancer" (what IS that?) or vital gluten or ...? However, there's always fresh milled, where one can manipulate flour fineness and thus perhaps crumb softness. I look forward to that someday. Let me know if you have any questions about the formula and process. Happy to contribute. Those 100%ww aficionados are stubborn buggers. I know. I'm married to one. Good lookin fresh miller 100% ww. Must be delish. But I use store-bought ww flour (One Degree Organic Sprouted), not fresh milled, for these 100% WW loaves. Some day I'll have a mill with that kind of capacity and hopefully soon. But it would make for a long milling and sieving session with my KA KGM attachment mill. but the sifting kept in my brain and I just switched in my mind that you were milling yourself. None the less a fine loaf. Oh if you like to sift you'll love to mill your own grain.